Cinnamon Viennese flavored coffee offers a dark roast of dark chocolate flavors mixed with a dollop of whipped cream and cinnamon spice. 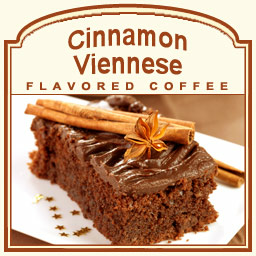 Enticing and flavorful, this Cinnamon Viennese coffee will stimulate your senses with its 100% Arabica beans. If you are looking for a little trip to Vienna, the Cinnamon Viennese flavored coffee will take you there. In a heat-sealed valve bag, this fresh coffee will be roasted and shipped on the same day. Let the Cinnamon Viennese flavored coffee wash over you and your taste buds � so you can indulge in the cinnamon flavors that will awaken your senses like no other dark roasted coffee!